We the undersigned, respectfully ask that Commissioner Barnier, on behalf of the Article 50 Task Force and the Rt.Hon. David Davis MP on behalf of the UK government, give attention in the next and in subsequent rounds of the negotiations about the United Kingdom's withdrawal from the European Union, to a Green Card for Europe which, when used in conjunction with settled status or permanent residency of a participating state (in this case any EU member state and/or the United Kindgom), would have the effect of enabling all the rights previously enjoyed by transnational citizens by virtue of the fact that they were EU citizens resident in another EU member state. 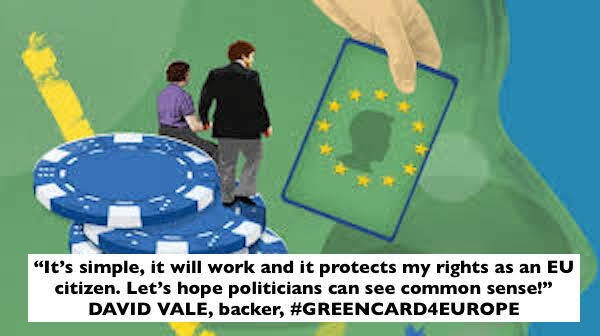 As well as signing the petition, it would be very worthwhile if you could take a few minutes to write to GuyVerhofstadt, Coordinator of the Brexit Steering Group in the European Parliament. We have launched a crowdfunding appeal to support the success of this initiative.